The regular season is complete and it is playoff time in Kansas high school football. Kpreps will continue to post state rankings throughout the playoffs culminating in our final poll after the state champions are crowned. Let’s take a look at the Kpreps.com rankings for November 3rd powered by Pinamonti Physical Therapy. There was little change in the top five in all classes this week. 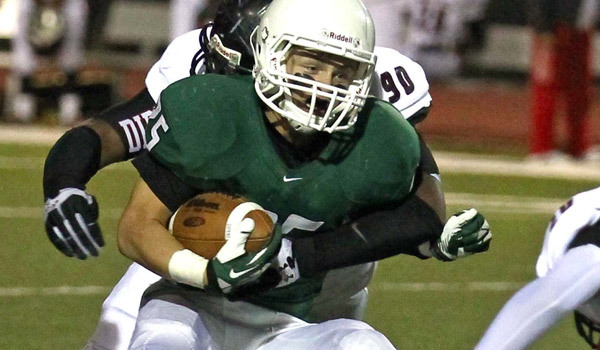 In Class 6A, Derby remains on top after posting a 28-6 win over Wichita Heights in the District 6 championship game. Lawrence Free State beat rival Lawrence 28-10 and remains at No. 2, while Shawnee Mission East is ranked third. Traevohn Wrench rushed for 220 yards and six touchdowns as No. 4 Gardner-Edgerton rolled last week, as did Blue Valley Northwest which remains ranked fifth. Bishop Carroll won its 22nd consecutive game by beating Liberal 53-18. The Golden Eagles open their 5A title defense at home against Newton this week. Bishop Miege blasted St. Thomas Aquinas 50-16 to remain in the No. 2 spot, while Salina South moves up to No. 2 after handling Great Bend. Blue Valley West enters the poll at No. 4 after edging Blue Valley 18-17 on a last-second field goal by Troy Burgett. The Jaguars are 6-3 on the season with their three losses coming by a combined 12 points. Mill Valley remains at No. 5 after beating Lansing by 60 last Friday. The Class 4A top five remained unchanged as only fifth-ranked Paola got a district test. The Panthers beat rival Louisburg 23-17 in double overtime on a touchdown run from ExZavier Miller. Paola will host Fort Scott on Tuesday in the first round. Top-ranked Holton shutout Royal Valley 26-0 and now must try and contain Hesston standout running back Ryan Schadler in the first round of the playoffs. The Class 3A top five also remained unchanged as Conway Springs’ 35-8 win over Douglass was the closest margin of victory among ranked teams. The first round match-ups shape up well for ranked teams, although No. 5 Caney Valley could get a challenge from traditional power St. Mary’s Colgan on Tuesday night. Centralia won at Jackson Heights 36-0 to remain on top of Class 2-1A. The Panthers received a good test from the Cobras (7-2), but recorded their fifth shutout of the season and held Heights to under 50 yards of total offense. Oakley and Lyndon also posted shutouts last week. The Tigers beat Northern Heights 36-0 and will face those same Wildcats this Friday in the first round of the 2-1A playoffs. In 8-Man, Division I, Atwood-Rawlins County falls out of the top five after a 54-28 loss to Hoxie. As a result, Hoxie enters the poll at No. 5 narrowly edging out unbeaten West Elk, Hodgeman County, and one-loss Central Plains. The remainder of the poll remains the same, but one of the top five teams will have a short playoff run as No. 3 Madison travels to take on No. 1 Osborne in Tuesday’s first round. In 8-Man, Division II, all five ranked teams recorded victories although only three teams actually took the field. Sharon Springs-Wallace County and Victoria each won by forfeit over Wheatland-Grinnell and Wilson, respectively. Baileyville B&B, No. 3 Hanover, and No. 5 Beloit St. John’s-Tipton all posted big victories to close out the regular season.